A little over a week ago, I had the blessing to spend two days with pastors and their spouses in Juarez, Mexico. I mentioned a little about it here. As I have reflected on my time there and the relationships God continued and some that were begun, I have been drawn to pray for one couple in particular. On Saturday morning of the retreat, sitting around the breakfast table, I listened to a couple who are struggling with a true dilemma. They explained their situation. The church in which he pastors is growing and they both feel God is blessing their work in the church. But on another front, they have witnessed a terrible crime, they believe to be related to the violence that has plagued their city for the past six years. If they approach the authorities, they will become targets themselves. If they say nothing, they feel they are not fulfilling their ethical responsibility for justice. While much of the communication was through a translator, I understand enough Spanish that I could pick up most of what they were saying. But the anguish and concern they both displayed transcended any language barrier that might have been present. The tears shed at that table over that hour were real. I have continued to think about this couple and their situation and ask myself what I would do if I were in their situation. I have to honestly say, I am not sure. When I think about the fact that God promises to be with us always then I think, maybe I would stick it out. Then I think about Jesus’ words pertaining to dealing with the world when he said to be as wise a serpents and gentle as doves. God gave us a brain to be able to discern what is best. Regardless of our answer, the main point I would make today regarding this story, is that I am reminded that here in the US, we really don’t have a clue as to what kind of persecution is happening around the world. We struggle with carpet colors for the hallways or what temperature to keep the thermostat set on in the worship center so that the fewest people complain. We wonder why people choose to have their children so involved in sports that they no longer have time for church activities. And while they are frustrations, we really have no clue what real struggles are like. We have it so easy. Father, forgive me for my shallow faith. Forgive me for being concerned about things that don’t really matter when all around me, people are struggling and need your hope and your salvation. Make me a light today! Life is not back to normal (whatever that is) but I can see the light at the end of the tunnel. For the last month and a half, we have been undergoing a face lift at the church. Most of the ground floor of our main building has been remodeled. That has meant relocating offices, putting up with a lot of noise, a lot of interruptions and a ton of dust. But other than a little counter top work, tile flooring and some cleaning, we can see the end. One of the things that God has reminded me through this process is that it is really easy to get into a rut and miss ministry opportunities. By being forced into a new work mode, I have seen things differently. I have been reminded that things don’t need to stay the same. We must never forget the past and the tradition, and those who have given their blood, sweat, tears and prayer to build what we have – both in the physical sense but also the spiritual sense. But while we must strive to honor our heritage, we cannot live in it. Our world changes daily. In fact, the old concept of developing a 5 and 10 year long range plan is not applicable any longer. The best we can hope for is developing a direction that will carry us for the next 24 months (and that is pushing it). In order for the church to fulfill her mission – the calling to share the Gospel with the world – she has to remain relevant – and yes, that includes our facilities. I realize that some of the changes we are making are different for those who have called 1st B their church home for 40 to 50 years, but the mission has not changed. The Gospel is the same today as it was 100 years ago. And the demand of the Great Commission is still the driving force of what we do. We have just tweaked the system of delivery and operation. God is at work, we just have to join him in what he is already doing! Last Friday and Saturday I had the opportunity to be blessed beyond measure. 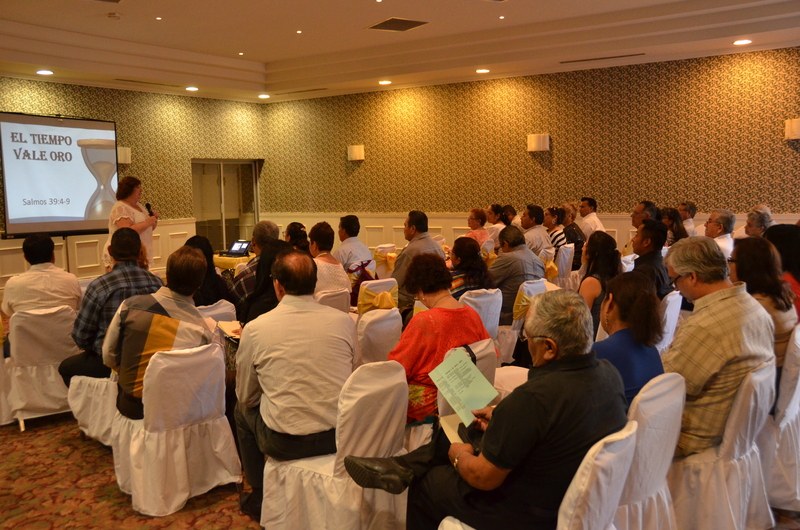 On Friday morning, 25 pastors from Juarez, Mexico and the surrounding colonias made their way with their spouses to a hotel in Juarez for a two day retreat. As the couples came through the door into the meeting room, I recognized some of their faces from last year’s event. There were some new faces as well. But they all had at least one thing in common – they were all happy to be there. It was a reunion of sorts. The focus of this year’s retreat was centered around spiritual formation. We hosted sessions on prayer and spiritual practices. We also had sessions on the things we carry as pastors and the fact that we have to find ways to lighten our load from time to time. All of the sessions were done well and the pastors and their spouses benefited greatly. But this year, the aspect of the retreat that seemed to grab my attention most was the benefit of having time to leave the worries of the ministry at home and just be around other couples who are experiencing the same struggles. The fellowship was amazing. The laughter and tears around the tables at the meals captured my attention. And on Friday night, after our big banquet, the couples gathered to play games. What was fun to watch (because I did not understand much of what was happening) was the fact that nearly all the couples participated in games they had played as children. In the same room we had pastors who have been serving churches for 45 plus years and pastors who are just getting started. But all were laughing and having fun together. It hit me that given the stress these families are under on a day to day basis, they do not have the opportunity to simply enjoy life and enjoy fellowship. I will share later this week, some of the stories of these couples and the stress they are under. It should be a matter of prayer for all of us. I was reminded of how important this retreat is in the lives of these ministers. God is at work in Juarez – even in the midst of the violence. And these couples have chosen to stay and minister – even when it is not easy – or even safe. Remember to pray for Mexico. Have a very blessed today!